This is a review of Triderma Scar Block, a clear gel that has been formulated to reduce and improve the appearance of scars. 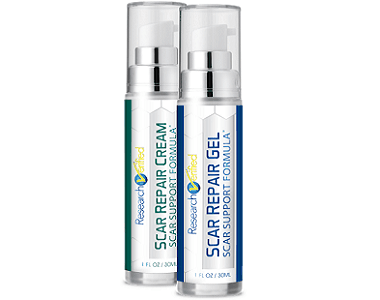 Where this product differs from many other scar treatment creams and gels, is that it can apparently be used before scars form, to minimize their development and promote faster healing of injured skin. 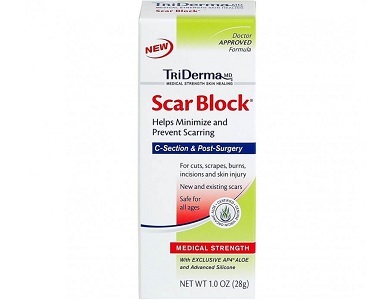 In other words, Triderma Scar Block can promote the rapid healing of cuts and scrapes, burns and other skin injuries – and even surgical incisions and help to ensure they don’t leave unsightly scars. Triderma also claims that Scar Block can actually dissolve existing scar tissue. 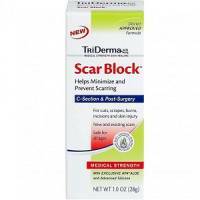 What’s In Triderma Scar Block? Dimethicone – a type of silicone that is widely used in cosmetics and skincare products. It helps form a protective barrier on the skin, rather than being absorbed to nourish the skin. Cyclomethicone – helps to make the skin feel smooth and lubricated, and is used in cosmetics to fill in fine lines and provide a “plump” look. Silica – a natural anti-inflammatory often used in products designed to relieve skin conditions like eczema and psoriasis. Aloe barbadensis (AP4 Organic Aloe Vera leaf extract) – a proprietary botanical complex that is said to contain over 200 healing properties to help reduce swelling, fight bacteria and soothe pain. How Do You Use Triderma Scar Block? You must apply liberal amounts of Triderma Scar Block to the scar or wound at least twice a day – more if you want faster results. Triderma recommends that if you have had surgery, you start to apply the product as soon as possible, preferably within 3 days, as this could reduce your chance of scar tissue forming. However, as most surgery wounds are usually covered with a surgical dressing for several days to reduce the risk of infection, we strongly recommend you discuss this with your doctor before applying anything to the cut. You can expect to pay around $17.99 for a 1oz (28g) tube of Triderma Scar Block. There were no specials or other discounts available from the manufacturer’s website at the time we were reviewing the product. Triderma offers a 30-day guarantee during which time you should contact them if you are not satisfied with the product. Once you return the product, you may receive either a replacement, exchange or refund. You have to contact their Customer Service center first, before returning any product. Triderma’s claim that Scar Block can provide immediate relief for damaged skin, thanks to its incorporation of aloe vera, sets it apart from many of the other scar treatment products on the market. In fact, Triderma Scar Block should probably be regarded more as a preventative treatment (to prevent the formation of ugly scars) rather than as a treatment for old, established scars. There is nothing we could find in the ingredients that would indeed “dissolve existing scar tissue” in line with the manufacturer’s claim. However, as we explain above, we would hesitate to recommend that it be applied to surgical scars without the approval of your doctor. Be aware that although this product does not contain petroleum, it does contain silicone oils. Like petroleum products, silicone oils can actually make dry skin worse over time.